The Woman’s Society met on May 16, 2011 at Nancy Marstaller’s house. 15 women gathered for a devotional prayer by Dotty DeLoach, and a program by Sarah Sprogell. Sarah shared her experiences with Bobbie Jordan in the last months and moments of Bobbie’s life here on earth. We were all touched by the pure love and devotion these two wonderful women share for each other and join Sarah in prayers for her next steps in her journey. In business, Prayers were asked for the recipients of the Joy fund who are Christine Wood of Kickapoo Center; Brenda White of Mesquakie Center; and Ann Kendall of MOWA Choctaw Center. We would also suggest you include Joseph Makokha in your prayers. He is the clerk of the Friends Church Peace Team in Kenya and is much involved with the Peace Curriculum being developed for Kenyan schools. The Tedford Meal for May was hot dogs, and buns, green salad and 2 wonderful deserts. Kitsie Hildebrandt has purchased four platters to be used for Woman Society sponsored events and was asked to purchase a few more in the event of breakage. The new Blueprints for 2011-2012 are available for purchase for $5.00 from Margaret Wentworth. Angie Reed asked that members review the book list for the coming year in the Advocate and let her know if there are any books on this list you would like to read during our next year’s reading program. Final plans were made for this year’s yard sale to be held May 28th at the Meeting House. Please look for new pricing on our Jumble items. Lastly, Nancy Marstaller read an email from Tess who is in the Peace Corp in Tombel, a province of Cameroon. She has asked for a care package for her students to help her put on a summer camp for girls this coming summer. We will put together a care package similar to that sent to Japan to be mailed out after Father’s day. See newsletter article for more details. 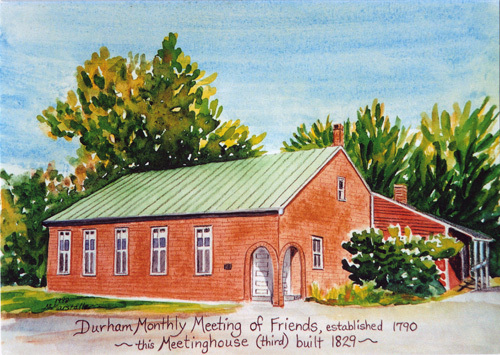 The meeting was closed by Kitsie who read a poem by Mary Oliver which in part said… in life “it is not the weight you carry but how you carry it.” The next Meeting will be hosted by Dorothy Hinshaw on June 20th at her home at 5:30pm. This entry was posted in Committee Reports, Woman's Society News. Bookmark the permalink.